Dental Implant Problems. Which unexpected issues might crop up? Dental implant problems are usually rare. But some problems with dental implants might be serious. How can you tell a small problem from a serious one? It's not always easy. So here's a guide to help you understand what's happening when you get a dental implant. 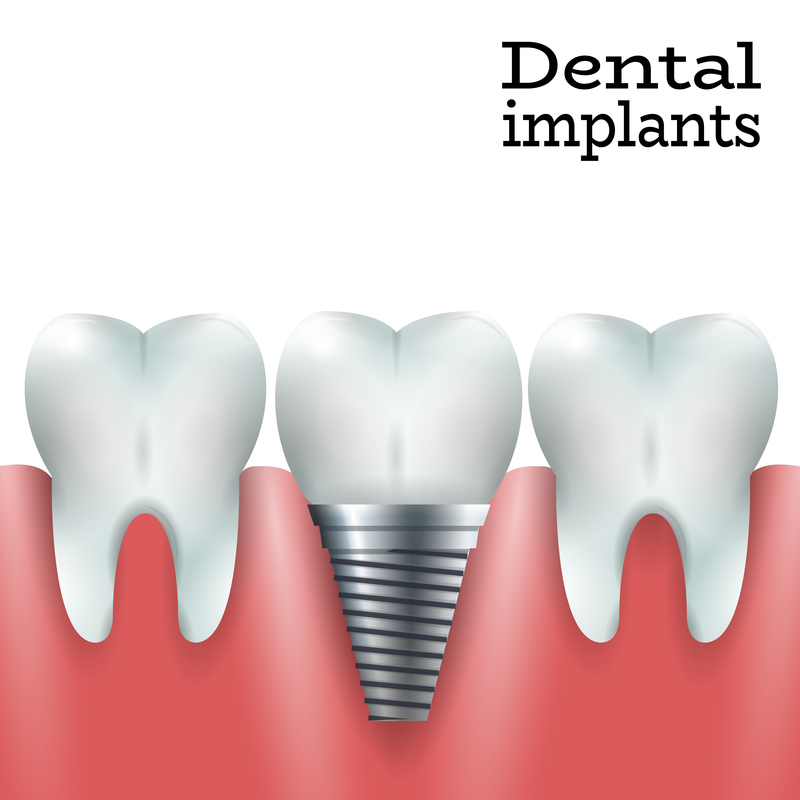 Most dental implant problems happen in the first 3 to 6 months of getting the implant. This is during the healing phase, right after you get the implant put in. The overall success rate of dental implants is very high, better than 95% in most cases. So a dental implant problem that leads to the implant falling out (or having to be removed) is very unlikely - but not impossible! For a more detailed description of how a dental implant stays in place, I would recommend that you first read Dental Implant History. It will explain the whole idea behind dental implants, and how they were developed. It was a chance observation by swedish orthopedic surgeon Prof. Branemark, that led to the development of dental implants. To help you understand the possible problems with dental implants healing, I also recommend that you then take a quick look at Dental Implant Healing. This gives you a bit more information about what's important for success with your dental implant. Go ahead, I'll wait for you here! See you in a minute. OK, now that you know a bit more about how implants work, we'll take a look at potential dental implant problems. First off, most dental implant problems are minor, more of an inconvenience than anything else. BUT sometimes serious problems with dental implants can appear. Problems which may result in losing the implant. However, this is rare. The failure rate for dental implants is around 3% to 5%. This means that for every 100 implants that a dentist puts in, about 3 to 5 will fail, and have to be removed (or fall out on their own). That is the first of several possible dental implant problems - simple failure to become fused to the bone within 3 to 6 months. Not enough bone to anchor the implant in the first place, resulting in "micromovement". Poor blood supply to the bone around the implant. Let's look at these possible dental implant problems one by one. First, infection. This can happen in 2 ways. The most common way is that there is already some infection in the jawbone where the implant is going to go. For example, you may have had an abscess on the tooth, and when the dentist takes the tooth out, the infection is left behind. Normally your own immune system can deal with the infection. Sometimes your dentist will give you antibiotics to help. But it's possible for some infection remain in the bone. Then, when the implant is put in there, the bacteria that are there interfere with the normal healing process, or "osseo-integration" as Professor Branemark dubbed it. So the healing process is delayed, while your body tries to fight the residual infection as well as heal the bone around the implant, fusing it to the bone. Delayed healing is one thing. But it's possible for the healing process to fail completely. Your body treats the implant like a foreign body, for example like a shotgun pellet, and tries to reject it. The implant area will get red and painful. Antibiotics will calm things down a bit, in the short term. But it's probably already too late. When the dentist inspects the implant closely, he will see that it is loose. There is no choice but to numb the gum there and remove the failed implant. The other source of infection is gum disease or a gum infection, in the soft gum tissue over the implant. For gum infections, such as around a dental implant, the best solution is to apply a thin smear of aloe vera gel. The aloe gel has antiseptic and anti-inflammatory properties, and will reduce the redness and swelling where your gum is sore. It's remarkably effective! Just squeeze out a small blob of gel onto your fingertip (less than the amount of toothpaste you would put on a toothbrush) and smear it onto the gum where it's sore. Repeat every hour. BUT this only works with a high-quality gel, and I recommend the Forever product. You can read more about this, and order your aloe gel directly online HERE. The tooth that is extracted may be completely healthy, but it got loose due to gum disease. Again, there are bacteria all through the gum in that area, and the same problems with healing as I've just described can occur. Aloe Vera gel can help to fight the gum infection at this important early stage! Infection from one source or another is a major cause of dental implant problems. The best treatment is to remove the infected tooth FIRST, and then wait for a few months, even up to six months before fitting the dental implant. This gives your body plenty of time to deal with any infection naturally. Then, when the implant is put in, there should be no bacteria in the way to interfere with the healing process. This is the best way of avoiding dental implant problems due to infection. Why isn't this done all the time if there is a chance of infection? Because people are in a hurry. Dentists know that there are times when it's better to delay putting in an implant, if there is evidence of infection beforehand. But sometimes patients can exert a lot of pressure, and persuade the dentist to go ahead with the implant, against his better judgement. NEXT potential cause; Not enough bone to hold the implant firmly in place, resulting in "micromovement". When an implant is first put in, it is literally screwed into place. The dentist drills a pilot hole first, and then screws the implant into the hole. At this point, the only thing holding the implant into your jawbone is the screw thread. It's similar to screwing a wood screw into a block of wood. The dentist will normally use a miniature surgical torque wrench to screw the implant into place. There should be enough good solid bone to need a specific force (torque) to get the implant into position. If the implant simply turns and turns, going into place easily without needing any effort (enough "torque) then it will not be stable enough for proper osseo-integration. We want the implant to be firmly anchored in there, so that the magic process of osseo-integration can take place, literally fusing the implant to the bone. BUT, if there is ANY movement at all, the fusing process is likely to fail. Professor Branemark identified this as a reason for failure more than 50 years ago, when he was developing the technique! Even TINY movements, called "micromovement" can interfere with the integration of the implant. Preventing micromovement is critical to the success of any dental implant. 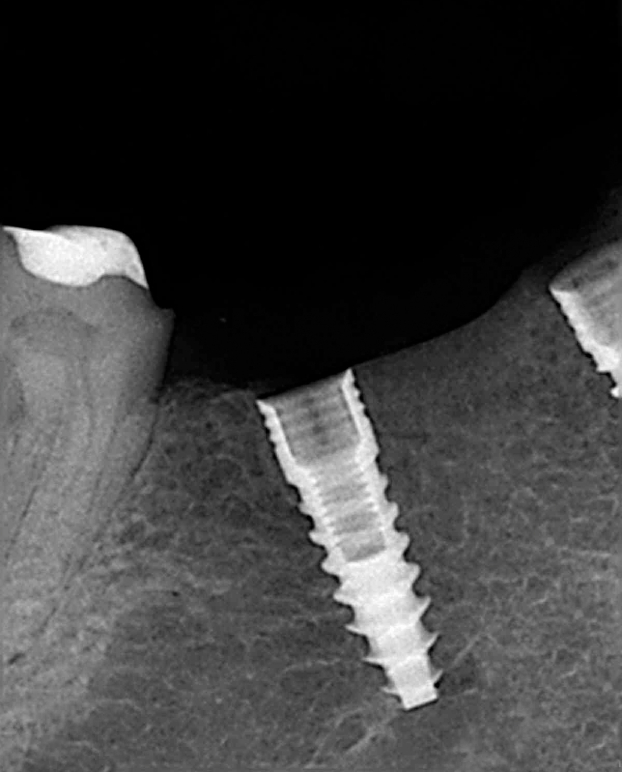 The MAIN cause of micromovement is that the bone around the implant is too soft, too weak, or simply there is not enough bone to support the full length of the implant. It's like trying to screw a one inch wood screw into a piece of wood only half an inch thick. You end up with half the screw still sticking out. With dental implants, the whole length of the implant may be buried under the gum, but it's possible that only half the length is screwed into bone, and the other half is just sitting in soft gum tissue. This sort of situation does not support the implant enough during the integration period, and it is likely to fail. In addition, if that bone is soft, like a sponge, it's even worse. The third cause is poor blood supply to the bone around the implant. This can happen for several reasons. If the jawbone is very dense, it tends to have smaller blood vessels going through it. At first, the dentist will think the surgery went well, because he was able to screw the implant into place really firmly, (he can feel how much resistance there is as he puts the implant in), and it will be solid. For now. But if the blood supply is poor, the healing process will be slower, and may fail in due course. This situation, where the bone is very dense, can be misleading. Even 3 months later, the implant can appear to be solidly in place, and you go ahead and get the crown or bridge fitted. But underneath the gum, the implant never became fused to the bone. It only seemed solid because the dense bone is still supporting it by the screw threads. Eventually it will become loose, and fail. Dentists refer to this as a "late failure". OTHER CAUSES of poor blood supply include smoking, and medical conditions like diabetes, or having long-term bisphosphonate ("Fosamax") treatment for osteoporosis. We always tell smokers that they should not smoke at all for a month or two after implant surgery. We know that the risk of failure is higher in people who smoke. THE NEXT BIT IS IMPORTANT. It is the effect of smoking on the blood circulation to the gums and jawbone BEFORE implant treatment that is the important point. If you have smoked for a number of years, the damage is already done. You already have a reduced circulation to your jawbone. The advice to stop smoking AFTER implants are placed is almost useless. Ideally, you should quit smoking for at least 12 months BEFORE dental implant treatment! This will allow time for your blood circulation to improve, and therefore reduce the risk of implant failure. OK, so your dental implant has healed well, and become integrated with your jawbone. What other possible dental implant problems can there be? Quite a few, as it turns out. There are quite a few potential problems that may crop up! About 3 to 6 months after getting the implant, the gum should be all healed up and the implant itself should be as solid as a rock. The dentist will take out the little screw and test the implant. He can test the implant in several ways. It's best to use ALL of them! The first test is to put a dental instrument into the top of the implant and just try to wiggle it. If the dentist can detect any movement at all, it has not "integrated". The next test method is to tap firmly on the exposed top of the implant. It should have a sharp, clear sound like tapping on a wineglass. It should not be a dull sound like tapping on a glass window. The third and most accurate way is to attach a small electronic measuring device to the top of the implant. It can detect the "resonance" of the implant. This is easily the best way. The best-known device for this is called the Osstel Mentor. The dentist MAY find that the implant is loose, even though you have had no problems so far! If this happens, he may choose to leave it for another 3 months to see if it gets any tighter, or he may recommend taking it out and replacing it. Assuming everything is OK, the dentist then takes a mold of the top of the implant and sends it to the lab for the crown to be made. The next possible problem is that the lab guy finds that the implant is not well positioned. The exact position of the implant is responsible for a lot of dental implant problems with respect to the appearance of the final tooth. Maybe the implant is at an angle to your other teeth. It might stick out towards the front of your mouth, or be angled back towards your throat. This means that the lab guy has to compensate for the angle of the implant, and has to make a "bent" crown to straighten up the appearance of the new tooth. This can be very difficult for the lab! Maybe the implant is too close to a neighboring tooth. This means that the lab guy has to make the crown very thin on one side, so that there is room for it to fit. Again, this can be very difficult, and the final crown may look a little different to your other teeth. Maybe the gum level is different to the teeth on either side. This is one of the most common dental implant problems. You normally get an implant because there was a problem with your own natural tooth. Whether it was loose, broken, infected, it doesn't matter. ALL these things will tend to cause the gum to recede around the natural tooth. When you put an implant in there, we know for a fact that the gum will shrink by another 1 to 2 mm. This means that it is common for the gum around an implant to be several millimeters shorter than the natural tooth on either side. The lab guy somehow has to make the tooth look as natural as possible, but no matter what he does, that tooth is always going to look "longer" than the neighbors, simply because the gum has shrunk back. Frequently we can get away with this, because it's not visible. For example, on a back tooth, you don't really see the gum line when someone smiles. But on a front tooth, it can be a major problem, especially if the person tends to show some gum when they smile. This one of many reasons why the best, most cosmetic dental implant treatments are often done by dentists who have specialised in gums - called a "Periodontist" - who has also taken an interest in cosmetic dentistry and is a member of something like the American Academy of Cosmetic Dentistry. As always, the solution lies in the planning. There are a number of possible dental implant problems that can usually be anticipated BEFORE the implant is done. An uneven gum-line is one of them. If there is a potential problem, the dentist should consider recommending addition minor surgery to the gum before implant placement, to help get a natural-looking gum-line at the end of treatment. You can find out a bit more about this at Bone Graft For Dental Implant. As a patient you will probably not be aware of anything. But the new crown may just look a little different somehow. If it's a minor difference, it's usually not noticeable. But if it is a major difference, the crown will "stand out" and look fake. If you think the crown just doesn't look "right", ask your dentist about getting the lab guy to re-do it. Once you have your new crown looking great, you may think that's the end of the road. No more dental implant problems? Possibly! There are some other dental implant problems that can crop up later on. You might notice the crown starting to wobble a little. Oh No! Is your implant coming out? Don't panic. 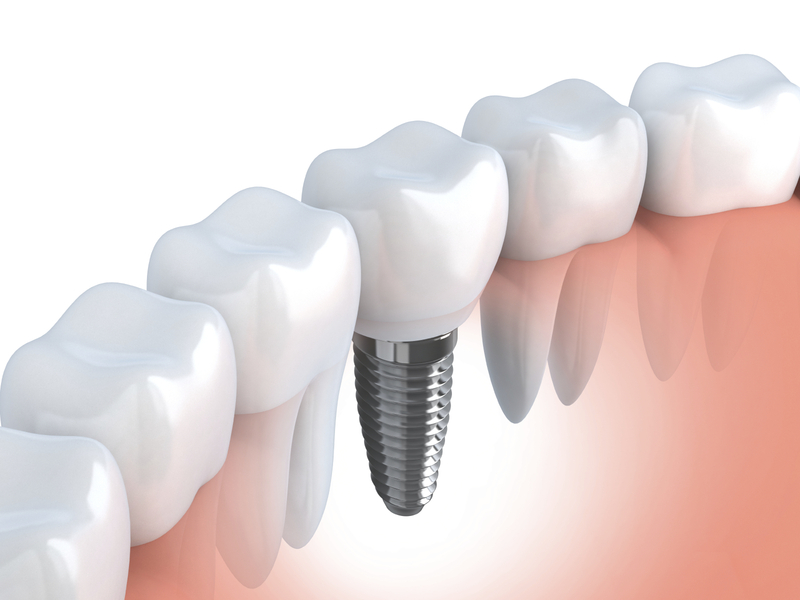 The most frequent cause is the loosening of the small screw that holds your crown onto the implant. It's usually quick and easy for your dentist to re-tighten the screw. Rarely, it WILL be due to Dental Implant Failure. Bad news, I'm afraid - you'll probably have to get the implant taken out. Assuming all has gone well so far, your new implant crown may feel fine, but one day you may notice the gum edge getting red around the crown. This may be caused by an inflammation of the gum around the implant. You can find out about this at peri-implantitis. You should get it checked by your dentist as soon as possible. The bacteria involved could slowly start to attack the bone around the neck of the implant, and over a period of months or years cause it to get loose and fail. Some problems with dental implants have a slow onset. Any other possible dental implant problems? Just one more to mention! It is always possible for a dental implant crown to break. It might be the porcelain on the biting surface, or it might be one of the components inside the crown or connector. 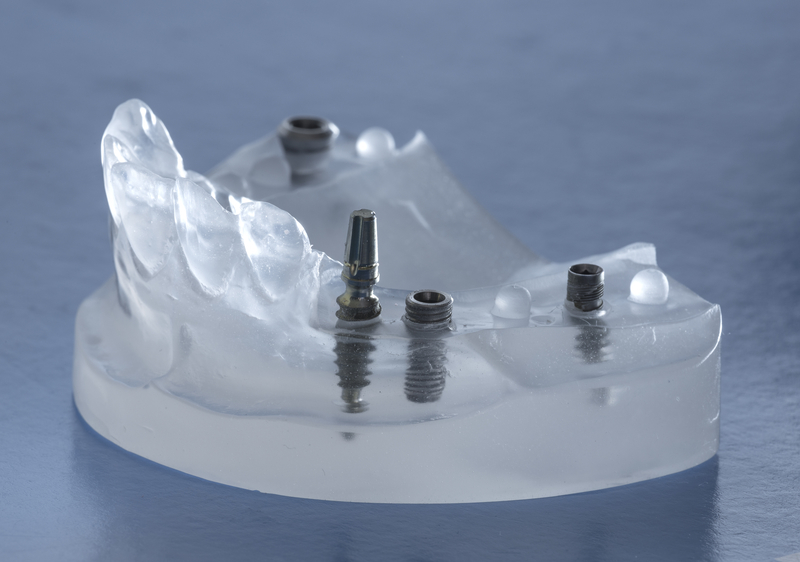 As long as the implant itself is OK, it will be possible to repair or replace the crown. No biggie. So, dental implant problems are unusual; outright failure only happens to 3% - 5% of all implants. Other problems occur a bit more frequently, but can fixed most times. Compared to nearly ALL other medical and surgical procedures, dental implants have an excellent success rate!